Hip No. 289, a son of Into Mischief consigned by Bridlewood Farm, was sold to Spendthrift Farm LLC for $335,000 to top the first session of the Ocala Breeders’ Sales Company’s 2016 Spring Sale of Two-Year-Olds in Training. The bay colt, who worked an eighth in :10 flat at last Tuesday’s Under Tack session, is out of graded stakes placed stakes winner Summer Song, by Sunday Break (JPN), a half sister to grade one stakes winner Don’t Tell Sophia. Hip No. 33, a son of Midnight Lute consigned by Randy Miles, Agent, went to Ruis Racing for $310,000. The dark bay or brown colt, who breezed an eighth in :10 flat at last Monday’s Under Tack session, is out of Platinum Preferred, by Vindication, a half sister to champion A Bit O’Gold. Narvick International paid $310,000 for Hip No. 128, a dark bay or brown filly by Shackleford who breezed an Under Tack quarter last Monday in :20 4/5. Consigned by SGV Thoroughbreds, she’s out of Royal Affection, by Vindication, a half sister to graded stakes winner Tiger Ride. Hip No. 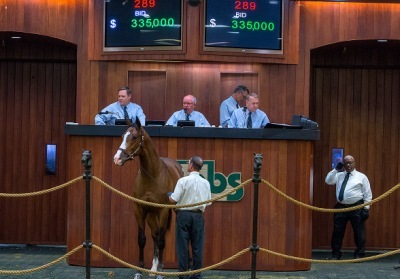 95, a bay filly by Street Cry (IRE) consigned by Stephens Thoroughbreds LLC, Agent, was sold to Alessandro Marconi / Al Aasfa Racing for $300,000. She’s out of Real Sense (IRE), by Galileo, a half sister to grade one stakes winner Saddex. Hip No. 148, a son of Pioneerof the Nile consigned by Bobby Dodd, Agent, was purchased by L. E. B. / D. J. / D. I. for $300,000. The dark bay or brown colt, who turned in an Under Tack eighth in :10 2/5 on Monday, is a half brother to stakes placed Zaahy out of graded stakes placed stakes winner Sangam, by Majestic Light. Mike Ryan, Agent, paid $300,000 for Hip No. 235, a daughter of Kitten’s Joy consigned by Hoppel’s Horse & Cattle Co., Inc., Agent. The bay filly, who breezed an eighth in :10 1/5 at Tuesday’s Under Tack session, is out of graded stakes winner Softly, by Binalong. Hip No. 242, a chestnut colt by Shackleford consigned by Envision Equine, Agent, whose quarter in :20 3/5 was the fastest work at the distance at last Tuesday’s Under Tack session, was sold to Ray Willis et al for $280,000. A half brother to graded stakes placed Pedaltothemedal, he’s out of Something Brewing, by Meadowlake. Hip No. 301, a daughter of Majestic Warrior consigned by Stephens Thoroughbreds LLC, Agent, went to Hill ‘n’ Dale Bloodstock for $270,000. The gray or roan filly, who worked an eighth Tuesday in :10 1/5, is out of Sweetest Song, by Unbridled’s Song, from the family of graded stakes winner Ifyoucouldseemenow. Justin Casse, Agent, paid $250,000 for Hip No. 288, a son of Quality Road who breezed an eighth on Tuesday in :10 flat. Consigned by L & S Thoroughbreds LLC, the bay colt is out of graded stakes placed Summer Savory, by Horse Chestnut (SAF). For the day, 154 horses brought a total of $11,180,500 compared with 181 selling for a total of $10,351, 200 at last year’s opening session. The average price was $72,601, up 27% from $57,189 in 2015 while the median price was rose 17.5% from $40,000 a year ago to $47,000. The buyback percentage was 28%; it was 20.3% last year.